February 23, 2013 / Hollywood, California, USA -- American Pop Art, Inc., a virtual art gallery at www.americanpopartinc.com, is proud to announce its contribution to the 2013 Oscars after party “Salute to the Stars – An Evening to Remember.” Proceeds from this event on Sunday, February 24, 2013 from 9:30 PM to 2:00 AM at the Andaz West Hollywood, 8401 Sunset Boulevard, West Hollywood, CA will benefit St. Jude Children’s Research Hospital. About 200 celebrities and more than 600 notables are slated to attend Bob Hellman and Richard Walter’s “Salute to the Stars – An Evening to Remember,” an after celebration party following the 85th Academy Awards. 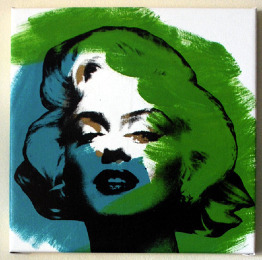 American Pop Art, Inc. has contributed for silent auction artist Steve Kaufman’s 1998 Marilyn Monroe pop art painting titled “Marilyn,” a 13” x 13” limited edition, signed and numbered 27 out of 50 AP, or artist’s proof, which retails for about $3,000. Steve Kaufman captured the essence of one of America’s most beautiful, sought after, and photographed icons of the 20th Century. The colorful peacock blue and emerald swathed painting will be on prominent display amongst a stellar mix of actors and actresses, producers, directors, moguls, media, and glamour. Former assistant to Andy Warhol, Steve Kaufman (aka SAK) is remembered as one of the greatest American pop artists and a generous humanitarian. His subjects included iconic brands such as Coca-Cola, Campbell’s Soup, the Wizard of Oz, and many famous people including Marilyn Monroe, Mozart, Beethoven, and Mohammad Ali. Steve Kaufman’s paintings made their way into the homes and hearts of many people worldwide. February 12, 2013 marked the 3-year anniversary of the pop artist’s death. The mission of St. Jude Children’s Research Hospital is to advance cures, and means of prevention, for pediatric catastrophic diseases through research and treatment. For additional information about St. Jude Children’s Research Hospital, please visit http://bit.ly/VYnUxa.